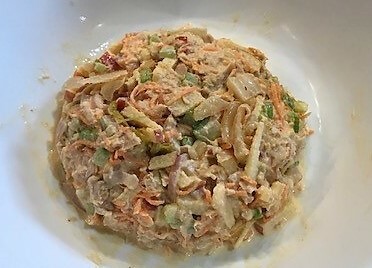 It is always great fun in my kitchen to fine tune an old favorite recipe, in this case (tuna salad) using 21st century nutrition principles while incorporating WOW flavor. I’ve also substituted wild tuna with using wild caught cod at times too. Both are marvelous! This recipe provides a delectable way to incorporate more omega 3s, vegetables and fermented food in each bite. Bon Appétit! Prepare vegetables and add to a bowl. Flake Wild tuna into bowl with fork. Place in Refrigerator and serve when ready. You can substitute spicy cod for an alternative to tuna. Add water and crab boil to pot and bring to boil. Add frozen cod and return to boil. Drain and flake with salt.